On the warmest October day of the year (what do you expect on 1st Oct?! ), we concluded the Youth Squad season with a short series of races - 8 members turned up and, although the conditions were squally, they completed the races - with a few capsizes! 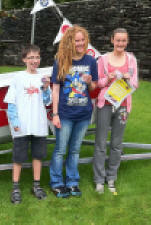 Six members of Bass Youth Squad attended a regional On Board regatta event at Windermere on Saturday 10th September. The Youth Squad members entered two teams in the endurance race and had a great day's sailing with a fantastic result coming 2nd and 4th (out of 10 teams entered).